However, that was not and is not the end of the project. I am happy to announce that we are in the midst of adapting NEOKOSMOS into a series of highly illustrated novels. That’s right, folks. Now you can read about your favorite miserable characters... with words. And pictures, still, I promise. So many pictures. We currently have the first novel completely outlined and are about 22k words into the first draft, with progress steady. But... we can’t do it without your help! If you check out our new patreon page, you will find that we now have our own discord server for patrons! On this server you can hang out with the creators, and receive access to development notes, sketches, and much more! There is even a special tier where we will send you PDFs of our drafts to read along with the story IN REAL TIME as we write it, and give your feedback! Come join us, and support the creation of your favorite dark and mysterious LGBT comedy sci-fi universe! We’d love to have you aboard. Hi everyone! 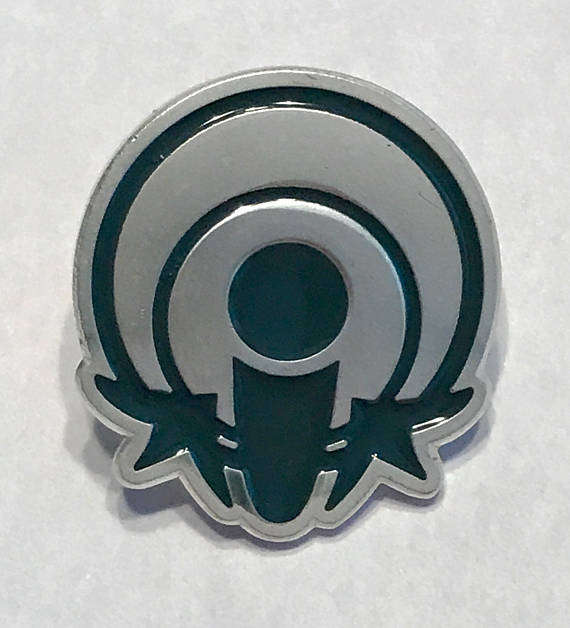 We are proud to officially announce some new merchandise– enamel pins! 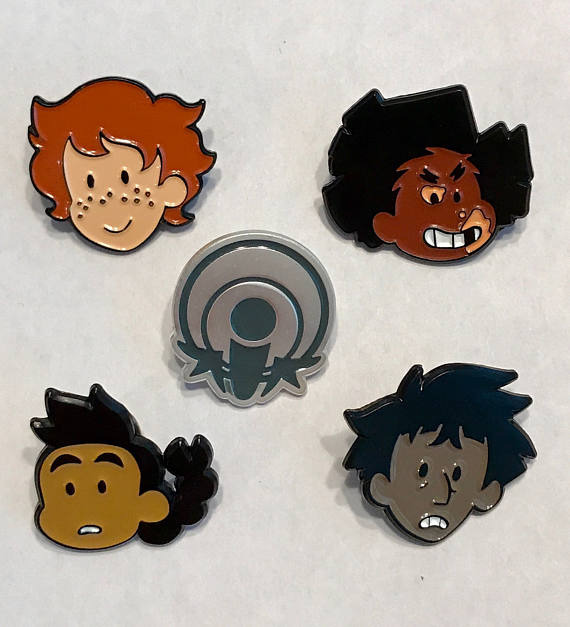 For 10 dollars, you can now wear your favorite NEOKOSMOS kid, or the Level 2 logo! We’re really excited about how they came out, and we hope you enjoy! SHOP HERE on our official Etsy page! Another update, this time to confidently confirm that NEOKOSMOS is going to return to a regular updating schedule. Yes, for real. You can expect roughly weekly batch updates from now to the foreseeable future. 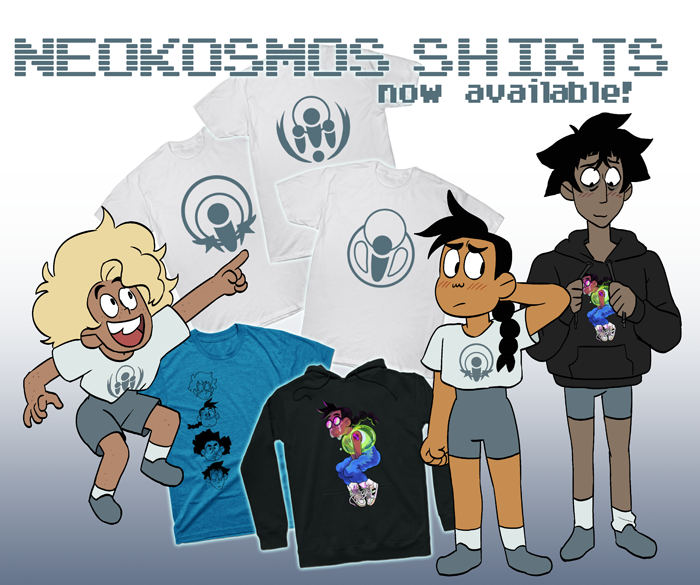 A quick announcement that NEOKOSMOS now has tshirts! If you ever wanted to dress up like the kid raised in isolation by aliens their whole life, now you can! Who wouldn’t want to represent that? Hello! It’s been a while since our last news update. Shelby and I have decided just to do a little housekeeping. A lot has happened in our personal lives since last September- most notably of course being our marriage! We’re halfway into February and the dust clouds are finally starting to settle. Neokosmos production has become a lot more streamlined as of late, and this is a great accomplishment and miracle for the two of us! The story is advancing further and further into it’s second act, and we couldn’t be more excited to work on it. Thank you for your support, patience, and interest in our story! Hi everyone, Shelby here with more news! As you may remember, Amber and I are working full-time jobs on Steven Universe and Hiveswap, respectively. Naturally, this is pretty time consuming! However, do not fear, for we are still working on NK almost every weekend! Because of this abbreviated schedule though, we have decided to move the comic into a “binge-watch” type of format— with large chunks posted all at once instead of irregular, smaller updates. We think this will make the comic a lot more fun to read and something to look forward to! With the storyboard format that we have, we feel its best appreciated in “chapters” rather than small scenes. So, when can you guys expect the next update? Here’s a bar of our progress! Keep in mind, we were just able to get back to work on NK after our hiatus a few weeks ago! So, progress is steady and we are really excited about the stuff we are working on now. So as you may have noticed, since our soft hiatus post in February we have not un-soft-hiatused the comic. This is because a very large very unrelenting amount of Life Stuff has been happening to us. Moving, work, traveling, more work, and soon, moving AGAIN, has kept us too busy to keep up with our regular updating schedule. Losing momentum is highly frustrating to you guys and even more so to us, and we have every intention of continuing the comic and get thing back on track again… God willing, by the end of July things can begin to ease back into updating once a week. Until then please bare with us as we continue to update as much as possible- once or twice a month. Thank you so much for your patience and continued support during this intense year! We promise we will get things back on track as soon as humanly possible. We hope everyone is having a great summer, and we will see you very soon! 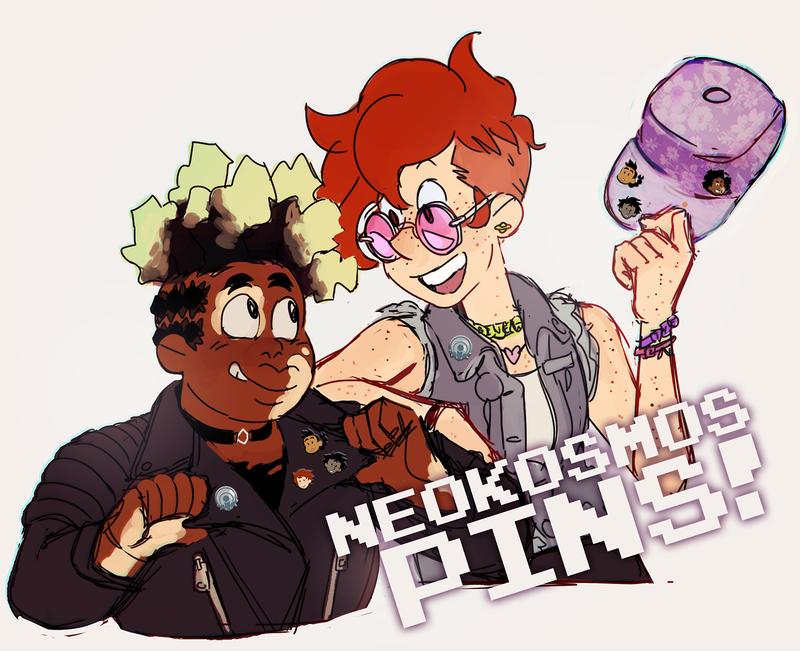 Firstly, the NEOKOSMOS Patreon! It has been re-tooled to offer you even more content- contributions from the blue half of our team, Amber, are now entering the mix! Streams, pdfs, commissions- it’s worth taking a gander at! “What about the original pages? I will miss them!” They will be readily available to PATREON BACKERS, and forever archived by us. Do not worry! “Will you be changing things- adding new pages or retconning the story?” NOPE! ABSOLUTELY NOT! This is going to be a purely cosmetic upgrade. “How long will this take? !” We have no idea! The best guess we can give you is two months. It could take more or less time. Luckily you can track the progress on account of the question below. “I’d love to see Shelby draw all these pages again! Will she be streaming this?” Why, I’m so glad you asked. YES SHE WILL! For patron backers $1 and up. Thanks again for reading NEO-KOSMOS! Big things are on the horizon…including a new animation? What? We didn’t say anything about that. Shhh. Hello everyone! Welcome to… the real beginning of NEO-KOSMOS. First of all, we’d like to say an official hello to Adrienne Garcia, aka paperseverywhere (paperseverywhere.tumblr.com), the third member of the NEO-KOSMOS crew! Adrienne has been working on this animation for the past few months now, and she really went above and beyond the call of duty. Thank you so much Adrienne, and welcome to the team! Another special thanks to Toby Fox (twitter.com/fwugradiation) for doing the sound for the animation. You probably heard of that game he made, UNDERTALE, () but if you haven’t, uh… maybe you should go check that out too. Thanks Toby!! A word of warning: from here on out, NEO-KOSMOS may include some upsetting content. It is not going to be a safe story, so please be mindful of this list of warnings we included with the latest animation. (neo-kosmos.tumblr.com/contentwarning) Everything on that list could show up in the comic at any time from now on. We hope you all continue to enjoy the story! Hello everyone! We hope your 2016 has been good so far. Thanks for sticking with us into the new year! We’re here with a few quick notes on site navigation. You can now navigate between pages by using the left and right arrow keys on your keyboard! And if that isn’t enough for you, you can also navigate by clicking on the panel images themselves to take you to the next page. We hope these changes enhance your reading experience. Coming soon, an RSS feed! Welcome back! We are back from our hiatus with a 52 page monster of an update! Wow. That is a lot of pages. Thanks for sticking with us! The story is really ramping up from here on out, and we are hoping to amp up the pace. As usual, we do not have a rigid update schedule, so keep following neo-kosmos.tumblr.com for update notifications, and enjoy the ride! Whoops, we probably should have made this post a few weeks ago, but there is going to be a pause in updates while Shelby is going through a big move! There will be an update this week, and then regular content will resume in September. Thanks for your patience! 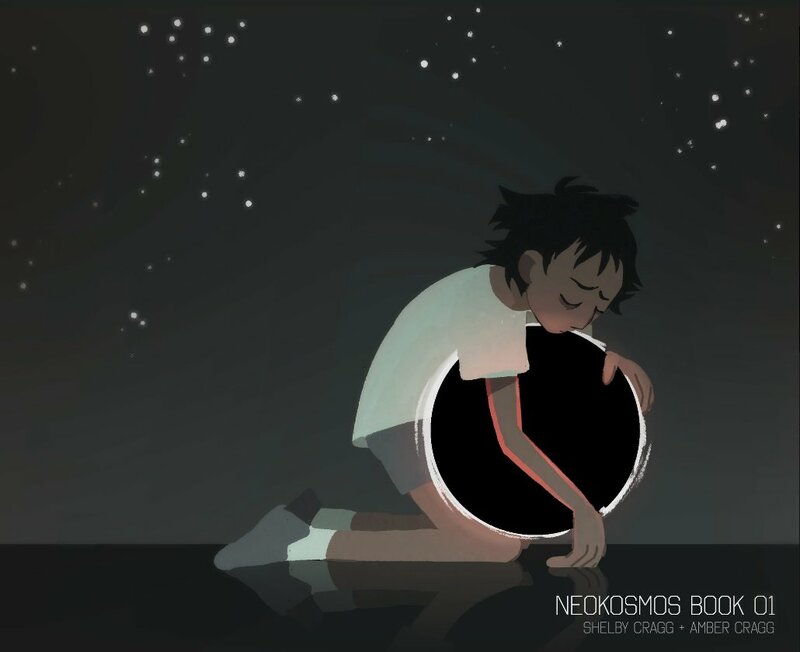 Hello and welcome to NEOKOSMOS, a new webcomic by Shelby Cragg and Amber Rogers! We don’t have much material yet, but that is because this is a reader-driven adventure. Feel free to submit your commands on the most recent page! Neokosmos updates at least once a week, so be sure to check back often. You can also follow our tumblr for update notifications, concept art, and much more. Thank you so much for reading and we both hope that you enjoy the ride!